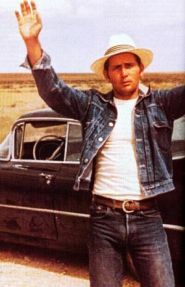 Martin Sheen. Sissy Spacek. Warren Oates. Ramon Bieri. Thriller. Drama. 1950s. 01 Nigel's Choice. Critics' Top 100. 01 Mel's Must Sees. Dave T's Platinum Picks. Serial Killers. True Stories. Road Movie. Violence. Rob Recommends. 01 Kelly's Heroes. Guardian 1000 Must See (2007). Recommended. 01 Becky's Bests. He was 25-years-old, combed his hair like James Dean. She took music lessons and could twirl a baton, she was 15. For a while they lived together in a tree house then in 1959, she watched while he killed a lot of people. A tale of two dumb kids going nowhere who achieved infamy in the US Midwest. The original to films like Natural Born Killers and True Romance. Sheen, Spacek and Malick debut in this impressive cult classic Brilliant - watch it!